4,645 days have passed since Operation Enduring Freedom was launched in Afghanistan in October of 2001. Over that period of time, 3,453 coalition soldiers and 21,000 Afghani civilians have been killed while the United States government has spent more than $727 billion on what is far-and-away the longest armed conflict in our nation’s history. However, America is just the latest in the seemingly endless string of global powers dating back to Alexander The Great’s Macedonian Empire to attempt to occupy what is now modern Afghanistan. If ever there was a region of the world that epitomized humanity’s inability to learn from the mistakes of history, this is it. When the War in Afghanistan finally ends and all of the casualty lists and fiscal damages are finalized, the statistical and tactical particulars of the conflict will find their way into history textbooks and countless academic and lay analyses of what transpired will find their way into print, which is all well and good except for the fact that it only describes the least arresting fragment of what actually occurred. It is the people and not statistics that make up the fabric of history and the heart of a war. In order to convey the depth and breadth of the conflict in Afghanistan, we need to preserve the lived experience of those who found themselves in the midst of it. Tell a young student today about the millions of citizens and soldiers that were killed during the Vietnam War and he or she will probably express shock or disbelief, but show that student a photograph of a naked and burned young girl running away from her napalmed village or a Marine trying to resuscitate one of his dying brothers and they will begin to understand the true costs of war. 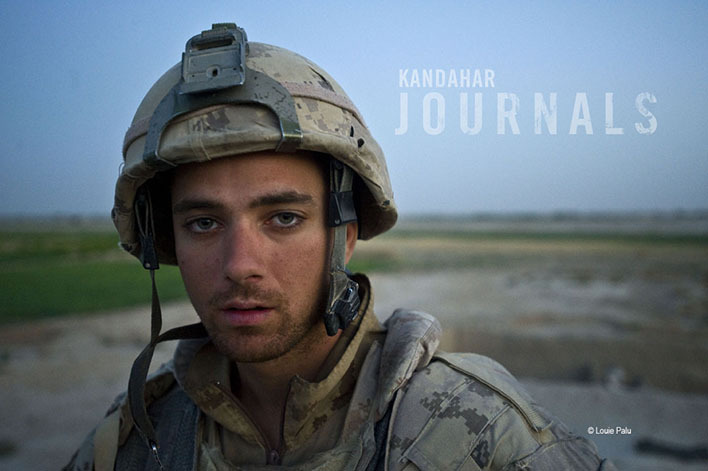 In the documentary film, Kandahar Journals, photojournalist Louie Palu and Co-Director Devin Gallagher illuminate the largely unseen and untold stories from the front lines of the War in Afghanistan through Palu’s experiences in the country from 2006 to 2010. As its name suggests, the film chronicles the time that Palu spent covering the War in Afghanistan in and around the city of Kandahar, which has served as the epicenter of the Taliban’s development since they captured the city in 1994 and made it their capital. From what little footage I have seen, the film looks to be an artfully crafted and sobering look at an uncovered front in a war that was in many ways eclipsed by the War in Iraq and, as a result, a war that has maintained a startlingly low-profile in the American media over the past decade. Palu and Gallagher are in the middle of running a Kickstarter campaign to raise the necessary funds to complete the film and, while they have already reached their minimum goal of $25,000, they are now looking to see if they can’t hit the $40,000 mark by the the time their campaign ends in 10 days. I urge you to donate money if you can and to promote the film on Facebook, Twitter, Tumblr and all manner of social media. This is truly an incredible and much needed look at the War in Afghanistan and I hope some of you will be just as excited to see the finished project as I am.